In the background is gunnera just coming up, underplanted with tulips: the prehistoric and the refined, side-by-side. An unusual combination, but it works for me 🙂 The gunnera looks like an enormous, prickly and leathery rhubarb and takes up A LOT of space in the summer, but at the moment there is plenty of room for tulips which will be gone by the time it is huge. Pleased to see some of the tulips coming back for their second or third year and not rotting away with the watering that the gunnera gets… Or the ‘natural’ watering that everything got anyway this winter. 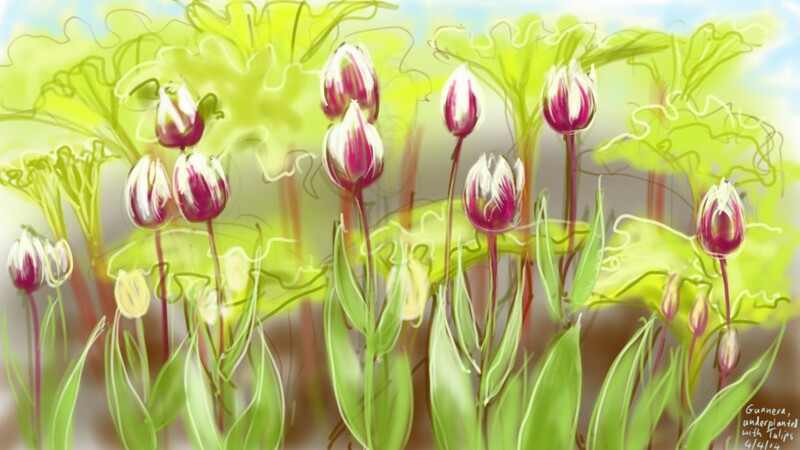 This entry was posted in Plants and tagged art, digital painting, drawing, gunnera, illustration, my garden, samsung galaxy note 3, sketch, tablet sketch, tulip on April 4, 2014 by Nancy Farmer.